To evaluate possible differences in periodontal inflammatory, microbiological and clinical parameters between women with preterm premature rupture of membranes (PPROM) and controls with uncomplicated pregnancies. Fifty-six women (32 test (PPROM) and 24 controls (uncomplicated pregnancies)) were examined at three time-points (T1: gestational weeks 20–35, T2: within 48 h after parturition, T3: 4–6 weeks after parturition). 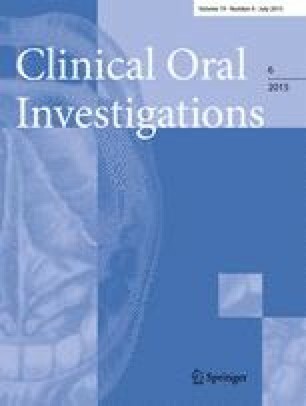 The examinations included assessment of the Periodontal Screening Index, collection of gingival crevicular fluid (GCF) and subgingival as well as vaginal bacterial sampling. Periodontal inflammation was found to be higher in the test compared with the control group (p < 0.05) and decreased over time in both groups (p < 0.05). Microbiological outcomes showed no intergroup differences (p > 0.05) in prevalence of bacteria, but a decrease in subgingival periodontopathogens from T1 to T2 in the test group (p < 0.05) was observed. Interleukin (IL)-1β levels in GCF at T2 were not different between groups (p > 0.05). In women with PPROM, GCF levels of IL-8 (p < 0.05) and C-reactive protein (p < 0.05) were lower and IL-10 levels higher (p < 0.05) compared with controls. Periodontal inflammation is elevated during pregnancy and seems to be more pronounced in women with PPROM. The findings of the present study revealed an association between periodontal inflammation and PPROM, thus emphasizing the importance of optimizing self-performed oral hygiene in pregnant women. The authors wish to acknowledge Professor Rutger Persson for his useful advices during initiation of this study and to express their appreciation for the laboratory work of Stéphanie Larti, Anna Magdon and Marianne Weibel. They are also grateful to the Department of Obstetrics and Gynecology, University Hospital Bern, the midwives and doctors and the women having participated in this study. This study has been funded by a grant from the Walter Haefner Stiftung, by the Clinical research fund of the Department of Obstetrics and Gynecology, University Hospital Bern and University of Bern, and by the Department of Periodontology, School of Dental Medicine, University of Bern. The authors report no conflicts of interest related to this study.